PAY IT FORWARD with RECOSI is a corporate donations programme which facilitates companies in the secure donation of IT equipment to disadvantaged schools, charities and community groups. Data is certifiably erased; the equipment rebuilt with a Microsoft Operating System and we PAY IT FORWARD on your behalf. PAY IT FORWARD not only helps charities, schools and community groups but it also supports the sustainable of employment of marginalised people and also those with disabilities. We take unwanted, surplus or unused IT equipment from companies who are no longer using it, we securely wipe all the data from the hard drives, rebuild the equipment using a new Microsoft Operating System, clean and repackage it and then deliver it to its new home so it can begin its new life. It’s a win, win situation…. 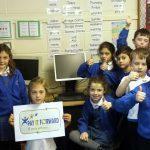 By donating, you are helping a disadvantaged school, charity, community group or individual with little or no funds to get access to computers. You are helping to provide employment for people with disabilities. You are helping the environment. You are doing all of this with peace of mind because you know we will securely wipe the data from your hard drives. 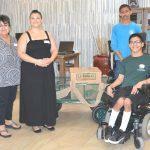 As part of our Pay IT Forward program RECOSI donates equipment to worthy causes. We were delighted to recently work with St. Joseph’s NS in Tullamore and provided them with computer equipment for their classrooms. 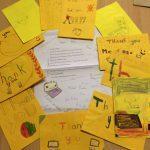 “We are thrilled to receive your donation of PCs to St Joseph’s. They arrived safely and are now installed in classrooms to the delight of our second class pupils. 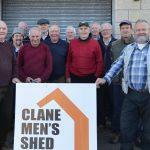 The Men’s Sheds are a great idea and we were delighted to be able to support the Clane Men’s Shed with some computer equipment. Hopefully the guys will be able to put it to good use and again, it is great to support such a worthy cause. For information on the Men’s Sheds go to http://menssheds.ie/ and for information on our Pay IT Forward scheme contact anthony.odea@recosi.net. James Lawless TD recently visited RECOSI’s Irish facility. 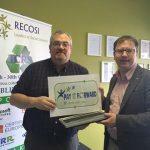 RECOSI will be making a donation of a high spec PC/Laptop to 8 lucky Non Profits, Schools, community groups or charities as part of our Pay IT Forward program and October Reuse Month. Please let us know who we should support and we will draw 2 per week, thank you and don’t forget to Reuse. Contact anthony.odea@recosi.net for further information. RECOSI recently donated a laptop to An Clochar to help them continue the good work that they do. An Clochar is a lay Catholic initiative, set up to promote the Catholic faith and the vocation and mission of the laity. 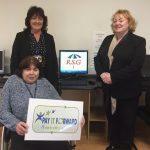 “I would like to say a huge Thank You to you and to all at Recosi for the HP laptop, recently donated with the Pay IT Forward scheme. We are delighted with it and are so grateful. It has helped us enormously.” Therese, An Clochar. 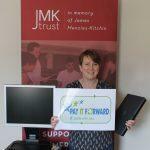 We at RECOSI were delighted to be able to Pay IT Forward with JMK Trust in the UK recently. Each year, the JMK Trust provides talented young and emerging theatre directors with awards, guidance and development opportunities. 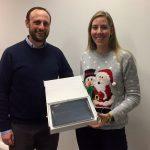 RECOSI worked with Applegreen recently to repurpose their redundant IT assets as part of our Pay IT Forward campaign – many thanks to Fiona and all in Applegreen. ‘Applegreen were delighted with the service provided by Recosi. Anthony and the team were punctual, meticulous and professional in the removal of all old IT stock. Like many organisations in a demanding environment it can be hard to find the time to complete a stock clear-out. Through working with Recosi, Applegreen are satisfied that all stock will be sanitised and re-used appropriately. Applegreen is known as a strong charitable organisation and as such are delighted that through donating to Recosi we are not only helping those with little or no accessibility to computers, we are also helping provide employment for people with disabilities. I would highly recommend that any organisation will have a positive experience using Pay IT Forward with Recosi. RECOSI and our partner organisation, Achieve Human Services, are delighted to be working with Cenpatico, an organisation providing comprehensive managed behavioral healthcare services for vulnerable and underserved populations. We work with Cenpatico to provide refurbished IT resources to some of their clients, such as Michelle, to enable them to start a business, further their education etc.